The Tektronix 549 is the only storage scope in the 500 series (except for the 537 that never left prototype stage). It takes a letter-series or 1-series vertical plug-in. The 549 was introduced in 1966 and discontinued after 1973. 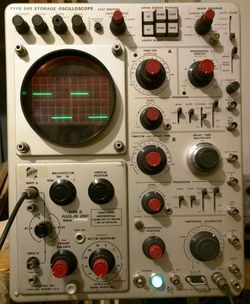 Like many Tek scopes from the period, the 549 uses a mix of transistors and tubes. For example, consider the buffer amplifier in the 549, whose purpose is to interface the high-impedance output of the plug-in with the low-impedance of the 200 ns delay line in the 549. As is usual in oscilloscope vertical circuits, the requirement is to have flat frequency response from DC to the maximum frequency of the scope and to have linear phase response over this same frequency range. In the 549, this buffer is implemented with a 6DJ8 cathode follower at the plug-in interface driving an NPN BJT differential amplifier at the bottom of a cascode with a 7119 tube on top. The output of the cascode (the plate of the 7119) drives the delay line. Since the entire signal path is differential, the common-mode voltage does not have to be zero, and it is not; the differential signal in the delay line rides on 167 volts of DC. After the delay line, the signal enters another cascoded differential amplifier with NPN BJTs on the bottom and a pair of 10-watt 8608 power pentodes on the top whose plates drive the CRT's vertical deflection plates of the CRT through inductive matching/peaking networks. The 549 is slightly unusual among 54x-series scopes in that it does not use a distributed vertical amplifier. (Other exceptions include the 545B and 547). Triggering is done using an NPN BJT Schmitt trigger. The 549 uses the T5490 CRT which has two storage targets, upper and lower, whose storage mode and erase signals can be controlled independently. There is a remote control cable/switch, part number 012-0102-00 (photo below), that can erase the screen and reset the single sweep. It connects to an Amphenol 165-16 socket at the rear top of the scope (see 549 remote control connector for pin-out). The 549's power supply provides regulated outputs of −12.4 V, −150 V, +100 V, +225 V, +300 V, +350 V, and +500 V as well as a +475 V unregulated output. Line input is connected to main transformer primary via two switches, one inside the chassis to select the 110 V or 230 V range, and another on the rear of the chassis to select Low/Medium/High voltage in either range. Multiple secondary windings feeds diodes for rectification for different voltages. Both center-tap and bridge configuration is used. Transistors and/or tubes are used for regulation. As is common in many Tektronix scopes, all regulated voltages are referred to the negative regulated rail (−150 V in this case) by fixed low-tolerance dividers. Only the −150 V voltage is trimmed, its reference is a 5651 VR tube. A 12AX7 is used as the comparator, three 12B4 in parallel are used as series pass tubes. A 6AU6 is used as an error amplifier. Most other stages replicate the same design, except slight changes in tubes used − the +350 V, +225 V and +100 V regulators employ a 6080 as the pass element. The −12.4 V regulator is transistor-based. The 549 power supply uses a 6N030 delay relay (P/N 148-0021-00) to control a relay that switches supply voltages on only after the tubes are warmed up. On power up, only heater voltage is applied to the tubes. After a delay of up to 60 seconds, the thermal delay relay activates the main relay (driven from unregulated +170 V). This also cuts out the delay relay, which can cool down and will be ready to delay again even after a quick interrupt in power input. The 549 has a 65°C (150°F) thermal cutoff. The 549 uses a 120-0423-00 HV transformer. 549 scopes from the Portland factory contain one black Areovox 0.5 µF / 400 V capacitor in the horizontal amplifier (in the middle of the upper chassis) which is often deteriorated (leaky). When this is the case, the trace is compressed on the right side. To confirm, temporarily disconnect this capacitor and power on the scope with intensity control at CCW, and after initial warm-up of a minute increase the intensity to test if the problem disappears. This capacitor is part of the beam steering arrangement during power-up to avoid screen burn. −150 V power on pulse is coupled via this capacitor to the R/C340 network in V343A's grid to move the beam to the left and off the screen during initial power up. The beam returns to screen after R/C340 discharges. The leaky capacitor can be replaced with a modern 0.47 µF / 630 V (or higher) capacitor. This problem does not appear to occur in Dutch-made 549s. This page was last edited on 23 April 2019, at 10:01.